Sanook, meaning “fun”, is a guiding principle of Thai social life. 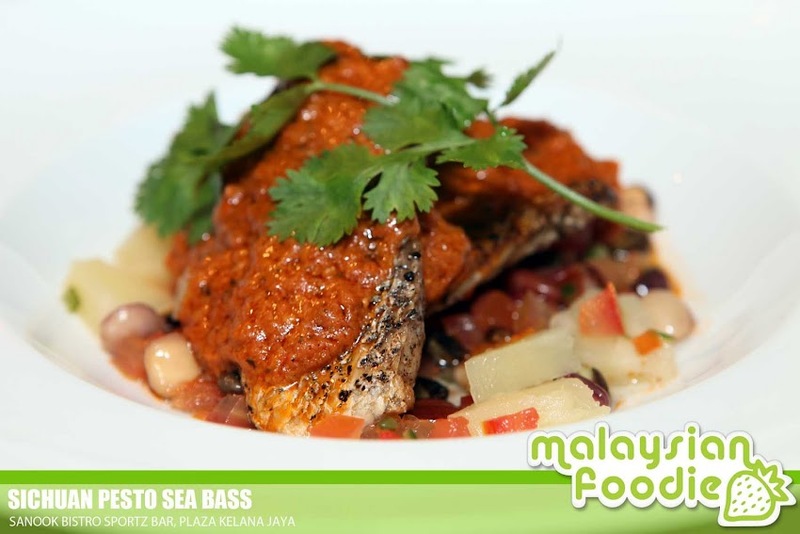 Sanook is located in Kelana Jaya and it is just right by the lakeside, embodies that principle. The place is simply a nice place to go to for relaxing as well. I just love the place there with not just lovely food but also good service. Thai snacks are one of the delights not to be missed in Sanook. One of it is Tod Mun Kung which is one of the famous snacks you can get in Sanook. One of it is Tod Man Kung where thai style deep fried shrimp cakes is being prepared with sweet basil. The snacks are good to have together with the beer too. Alfresco BBQ Wings is the next we are going to try. 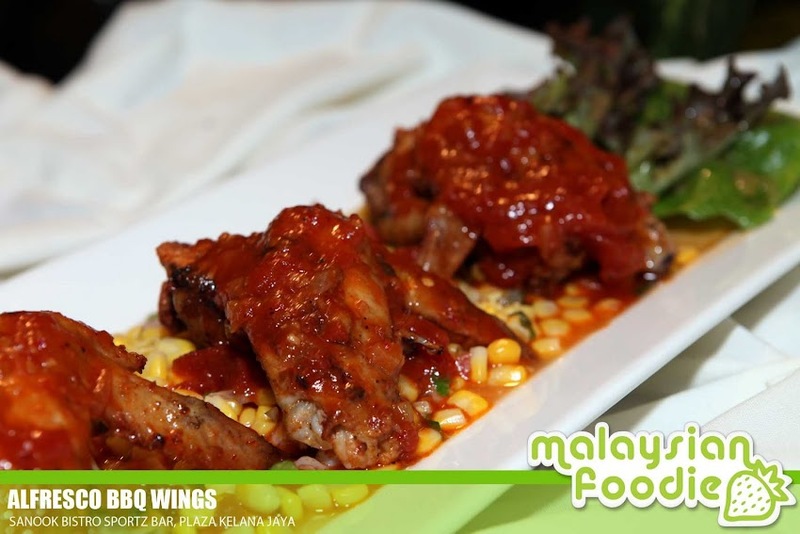 This is where the hot and spicy smokey chicken wings are being served with roasted herb garlic and sour corn mojo, accompanied with sanooks’s signature bbq sauce with it. The chicken wings is well made with the sauce which give the overall taste is good and I would like to have more. The BBQ wings is well marinated which turns the flavor amazingly great. Macho Nachos to start off our day this round where the crunchy yellow corn tortilla with spicy zing, topped with hot chicken tomato salsa and melted mozzerella cheese. 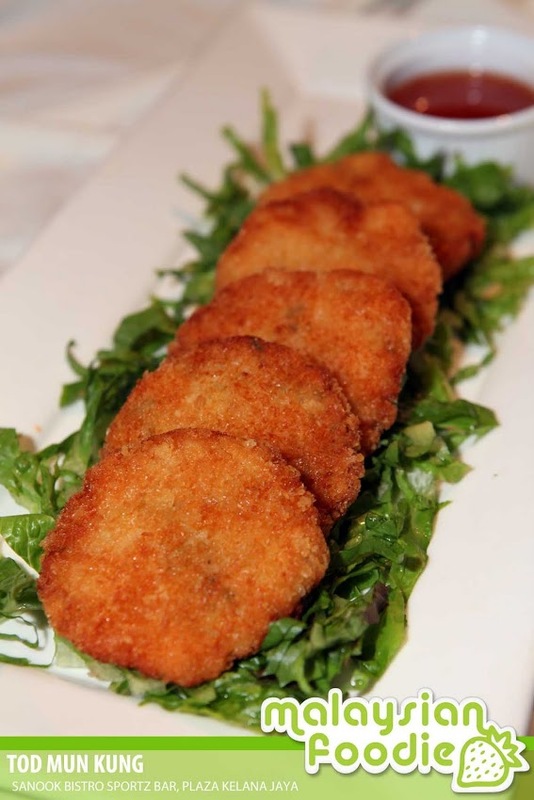 The crispy style of nanchos with the tantalizing spices is indeed a good mix to start off your meal. Sotong Otak Otak is another some new things we had tried. The 250gm Squids is being grilled and it is being stuffed with the prawn otak otak or so called the spicy prawn paste. It is then being served with the sambal tumis tumis (shrimp paste chili sauce), pilaf rice and garden green garnished with prawn crackers as well as the grilled shallots with it. 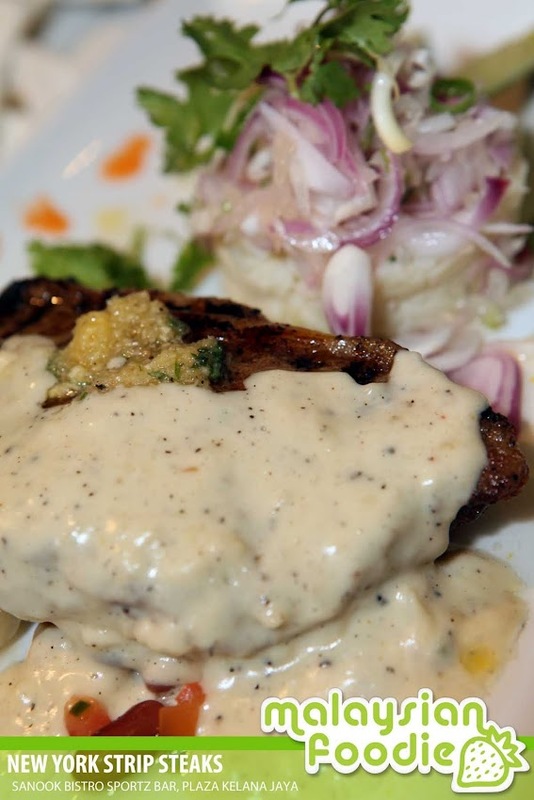 New York Strip Steaks is served at 259g where the best cuts of the beef strip steak are roasted tenderly in special roasted garlic marinade and served with pomelo and sweet onion salsa as well as the creamy garlic sauce. 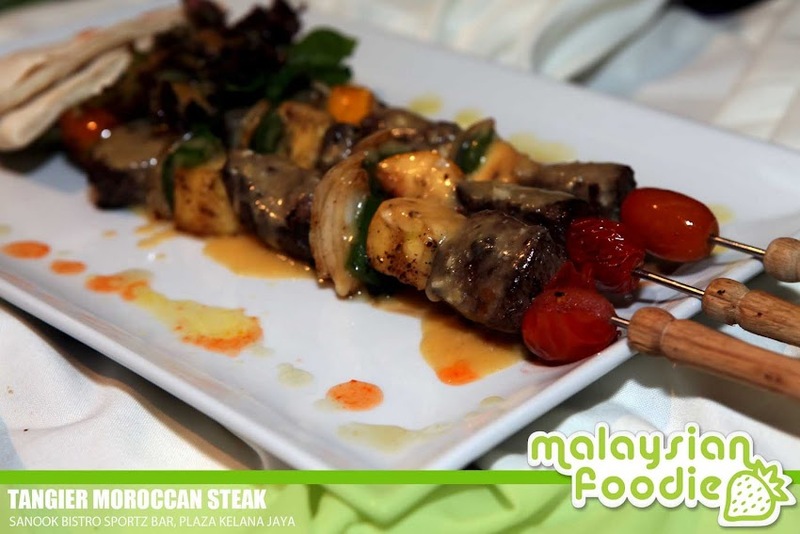 Tangier Moroccan Steak is served at 250 grams where the shirlion steaks are being served in the tangy apricot glaze. It Is then being grilled to perfection where the meal is being served with the fresh pita bread as well as the garden salad. 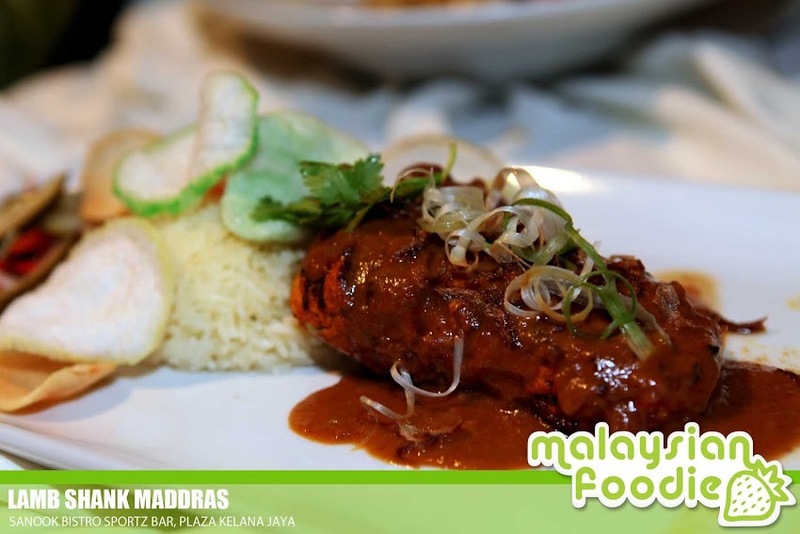 Kim Yang Lamb Cutlets is a fusion style which combines with the Korean speciality. This is where the lamb cutlets are being roasted together with the Korean spice and it is being charbroiled to perfection and accompanied wih the korean kimchi. Last but not least, which is my favorite as well as chef’s another recommendation which is the Teriyaki char siew chicken chop. This is where the chicken is being chopped in pieces and being brushed with the chef’s special soy sauce which is being marinade and served with the piquant pulm sauce as well as the pomelo sauce. .
Macro’s Spaghetti Alio e Olio Seafood Special is one of the Macro Polo’s favorite where the meal is indeed one of the asian twist where the fiery pasta is being served together with fresh tiger prawns, mussel, clams, & squids, flavored with coriander, crispy garlic and chilly flakes. The portion is good for one and it is indeed my favorite meals there when ever I am in Sanook. Excuse Me One Lagsana Please is kinda served a great name. I just love the name and it is kinda attaractive name too. The home made chef’s special, delicious lasagna which is being layered with crepes, lavished with bolongese sauce rich with cheese, zucchini foundae and cream cilantro.You may choose to serve with the choice of beef or chicken. We also made a try for their famous pizza which is the Hawaiaan Pizza. The pizza is made from thin crust and served with chunks of chicken meat as well as pineapple. The pizza is well made with the and it is being prepared by fire oven instead of the electrical oven which makes a taste even better and more fragrant. We ended the meal with some of the sweet bites which include tiramisu which is one of Old Time Italian favorites which is where the sponge cookie are being soaked in the strong coffee as well as the mascarpone cream. 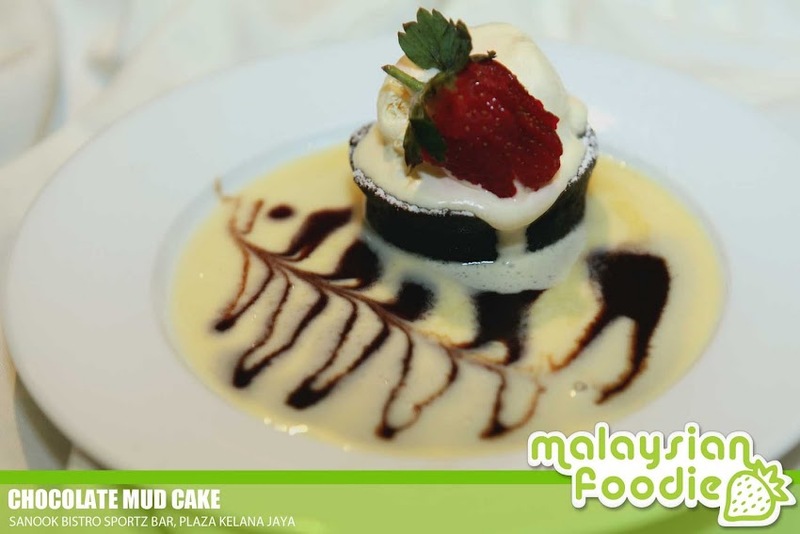 Chocolate Mud cake is also one of the best sellers where the savory mud cake is topped with the high-class delicious Haagen Dazs vanilla pecan ice cream on vanilla sauce. Simply irrestible. I tot was the Bistro or what.. Is Thai Restaurant!! !